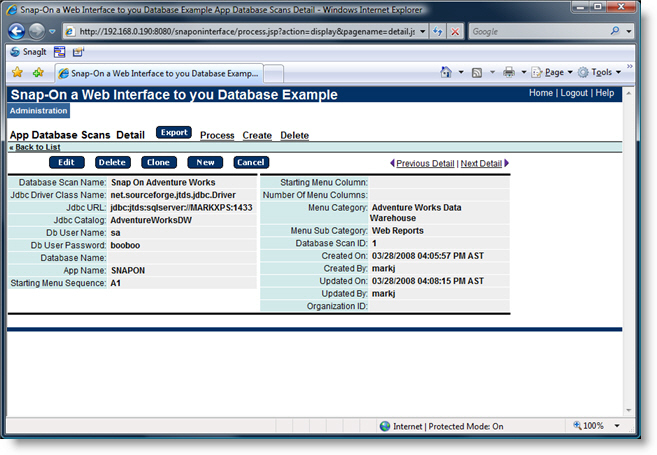 Five minutes to build a powerful Web-based Report? Well, this is really the central concept behind InfoSilk. We have taken the best methods of interacting with information and data that the Web has to offer (see Superior User Experience…..) , and we build those views for you whenever you create a new Web Report. We handle all the layout, design and development issues for you, behind the scenes! Just as simple as 1-2-3, and you have your report. Lastly, use your new Web Report. It’s the simple. In less than five minutes, your users can be viewing, customizing and interacting with the data they need. The InfoSilk Server is a Java Server application, which runs on Windows and UNIX for maximum portability. 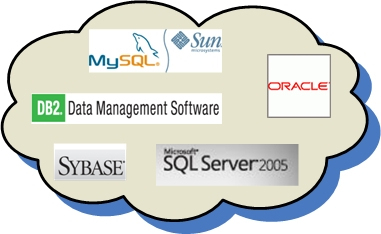 InfoSilk can easily be scaled on multiple servers to meet enterprise performance requirements. 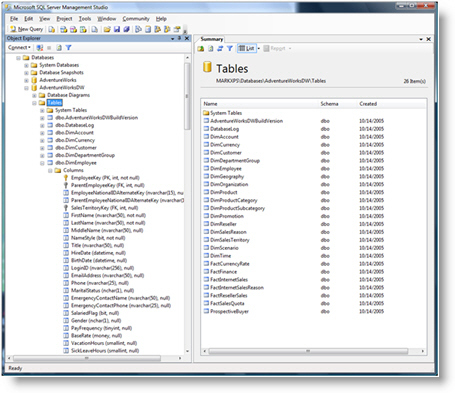 For less intensive demands, the Database, Java Server and InfoSilk can run on the same computer. 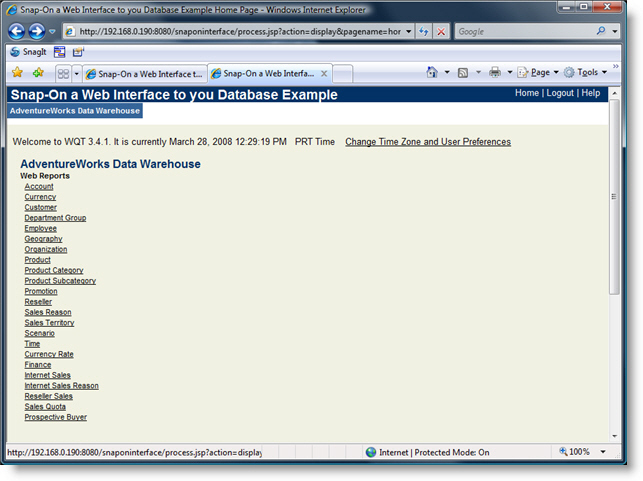 InfoSilk works by accepting requests from a web browser. To service the request, InfoSilk retrieves the application definitions for the application or report and dynamically builds the html, which is then sent back to the requesting user’s browser. InfoSilk is fully compatible with standards based browsers like Internet Explorer and Firefox. For much of Enterprise Computing’s history projects took a minimum of six months to a year from conception to deployment regardless of their complexity. The analysis, design, coding, testing and acceptance phases needed to be performed and they all took time. In the IT environment of today, the reality has changed and business users are expecting results in one to three months. 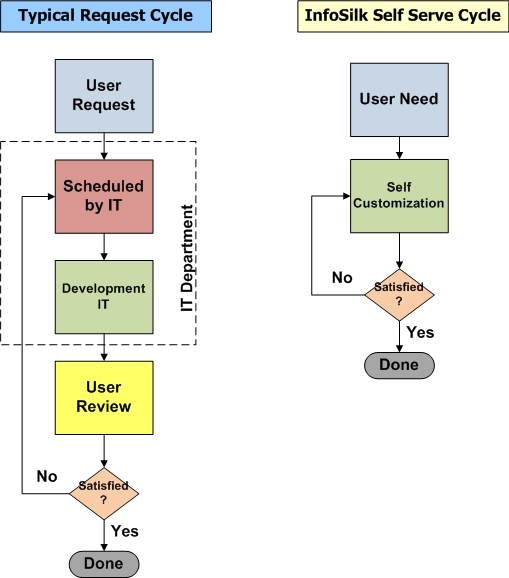 New software development methodologies are replacing the traditional analysis, design, coding, testing and acceptance phases with one of discuss, deliver and refine. In these methodologies, such as Agile Software Development, the highest priority is to satisfy the customer through early and continues deliver of valuable software. This development methodology reduces risk by shortening the time to deliverable and by recognizing that software that is seen and refined is most likely to produce the best results. Consumer IT refers to the growing practice of introducing new technologies into consumer markets prior to industrial markets. According to Gartner, Inc. this will be the most significant trend affecting information technology (IT) during the next 10 years. As a result, the majority of new technologies enterprises adopt for their information systems between 2007 and 2012 will have roots in consumer applications. The significance of this is that IT departments must deliver because user expectations are being raised by what they see in the consumer markets. Many applications are complex by nature and can not be simplified. But Web-based applications have introduced simplicity in many areas of IT. The standard Web-based application is significantly simpler than the Windows based application that it replaced. Simple solutions are perceived to be easier to develop and thus they create an increase pressure to deliver more with less complexity. 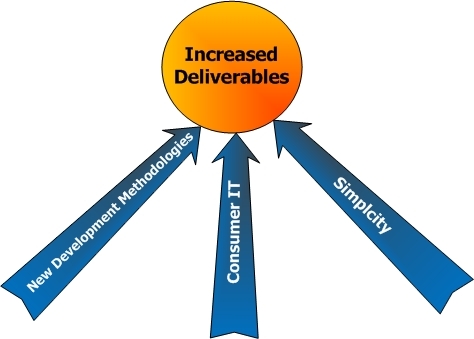 InfoSilk addresses the new reality of the demand for more deliverables. With an amazingly short time-to-market, InfoSilk will help you meet the demand for continuous short-schedule deliverables. In addition to satisfying user needs, faster deliverables greatly reduce projects and increase your project success rate. 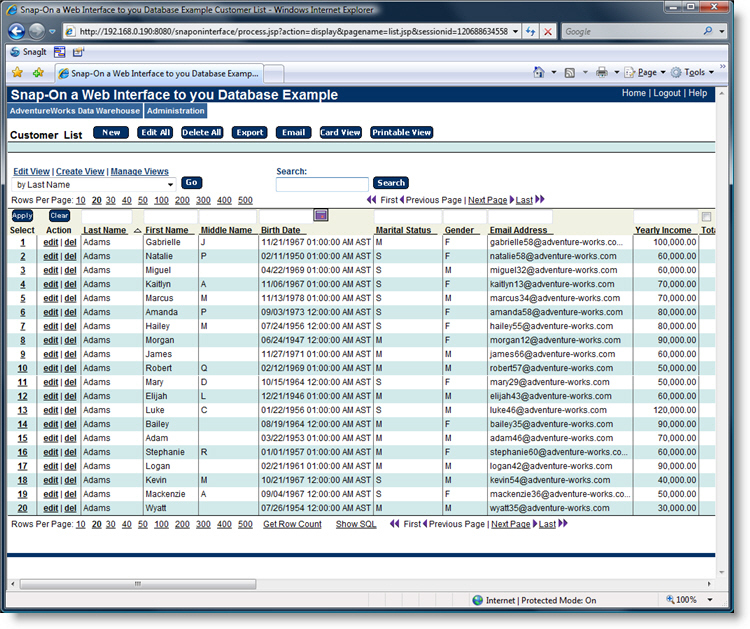 InfoSilk has numerous features, controlling who can view and update your data. User ID and password security control access to all applications. Users can be limited to read only access, prohibiting them for updating any data. 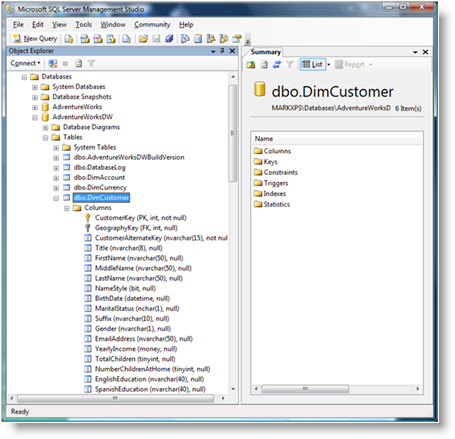 The next level of security restricts which functions and tables a user can access. Users can be grouped to facilitate the assigning of rights to users with similar data access needs. 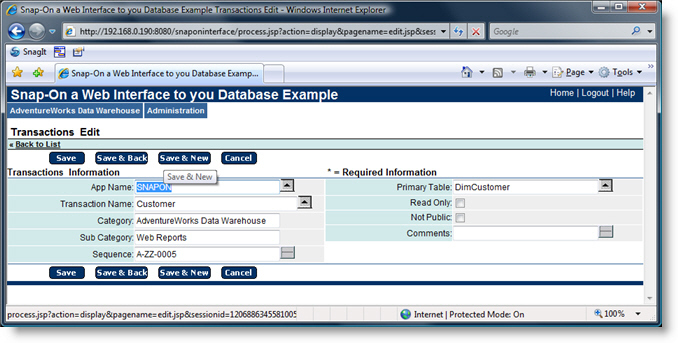 This security level also allows the controlling of which columns in a given table a user can access. 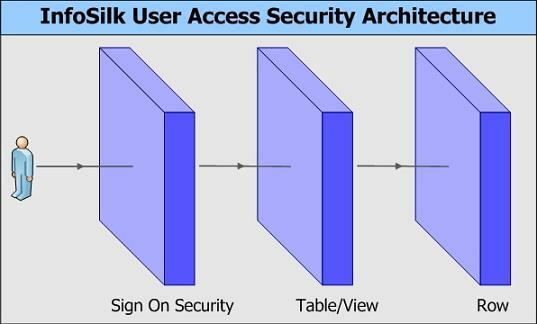 The third level of security is at the row level, limiting which rows of a table a user can access. 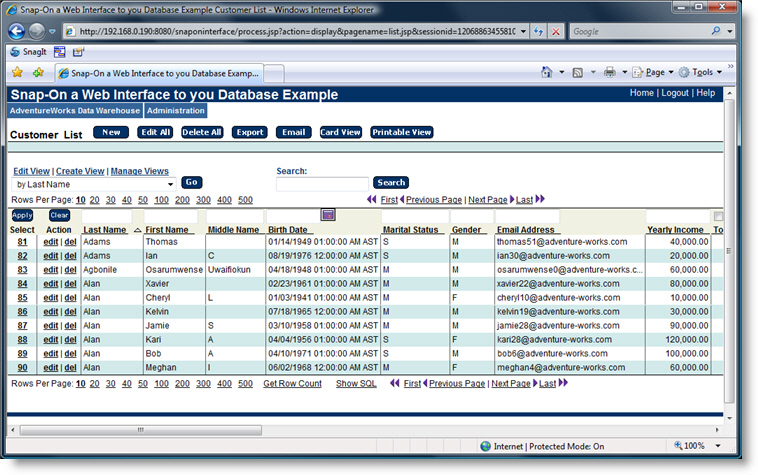 Taken together, the security features of InfoSilk gives the organization full access control of their data. 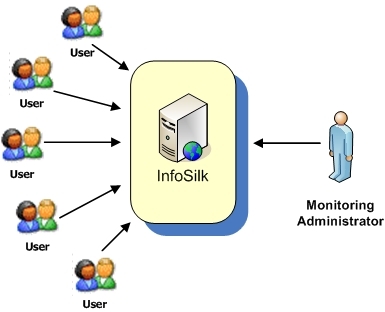 InfoSilk’s monitoring facilities allow you to view every access for every user, so that you can see when and from where your application is being used. Elapsed time data allows you to see which functions are taking the most time, so you can tune your database to meet your performance requirements. Function and view monitoring inform you of the degree to which the various pieces of your application are being used. Error message reporting informs you of which application sections users are having difficulty with, enabling proactivity in your application support. With per CPU pricing, you might decide to under-power your reporting to save money. With per Application pricing, you might decide to not implement needed reporting applications to save money. 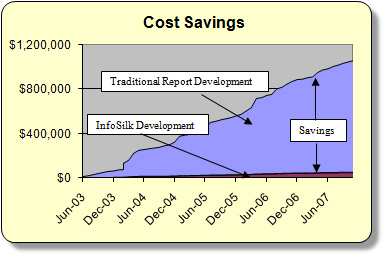 Per Developer pricing does not make sense for InfoSilk because developer’s are not needed to deploy your reports. Our goal at InfoSilk is to enable any company to take advantage of our unique and powerful product. We have chosen a per user pricing model to make InfoSilk affordable to any size company.